What is ForestWorks role in the development of skills standards? Through contractual arrangements with Skills Impact, ForestWorks provide services to the Industry Reference Committees (IRCs) for forest, wood products and pulp and paper. We support these IRCs in the development and review of training packages, including skills standards and qualifications. As part of our Industry Training Advisory Body (ITAB) role, we also provide independent advice on skills, training and workforce development needs for the Forest, Forest Products and Furnishing industries. The skills standards and qualifications for a particular industry (or related industry sectors) are grouped together into ‘Training Packages’. Training packages are made up of qualifications, units of competency and skill sets. Training Packages also include one or more quality assured companion volumes, to assist RTOs with the implementation of skills standards and qualifications. Training packages are developed with input from industry to ensure they accurately reflect the skills and knowledge used in our industry. There are nationally recognised qualifications available to support every job role in our industry. Increasingly, advances in technology and the development of new types of timber and wood products mean workers in the forest, wood, paper, timber and furnishing industry require different and more sophisticated skills. The Industry Reference Committees (IRCs) for forest, wood products and pulp and paper guide the development of qualifications that cover the full spectrum of job roles in our industries – from Certificates I, II, II and IV, to Diploma and Advanced Diploma. ForestWorks has a role in facilitating this process. What are units of competency? Units of competency are the building blocks of qualifications. They define the requirements for effective performance in a discrete area of work, work function, activity or process. Core units: these units describe skill areas that are regarded as fundamental to working in the industry, including skills that are used daily in a job role. When forming a qualification, these units are compulsory. Skill sets are smaller combinations of units of competency that cover skills required for specialist industry needs. Which sometimes can link to a regulatory requirement. The benefits of a skill set for workers is that they receive a statement of attainment which demonstrates to an employer exactly what competencies and skills the worker possesses. The benefits of a skill set for employers is that they allow workers to be trained to meet an immediate business requirement. How are training packages used by RTOs? 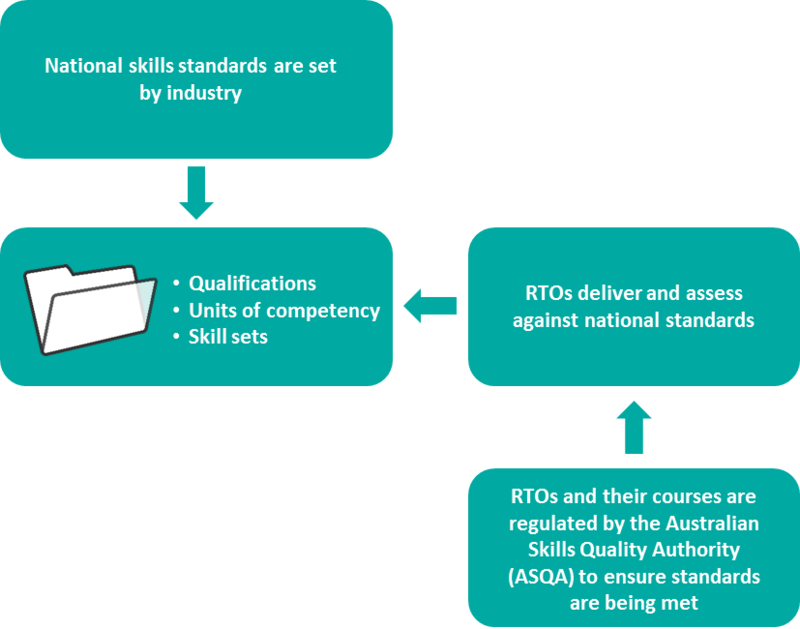 RTOs are responsible for assessing whether an individual meets the skills standards specified by industry and described in a training package, and for issuing a nationally recognised qualification, unit of competency or skills set where appropriate.